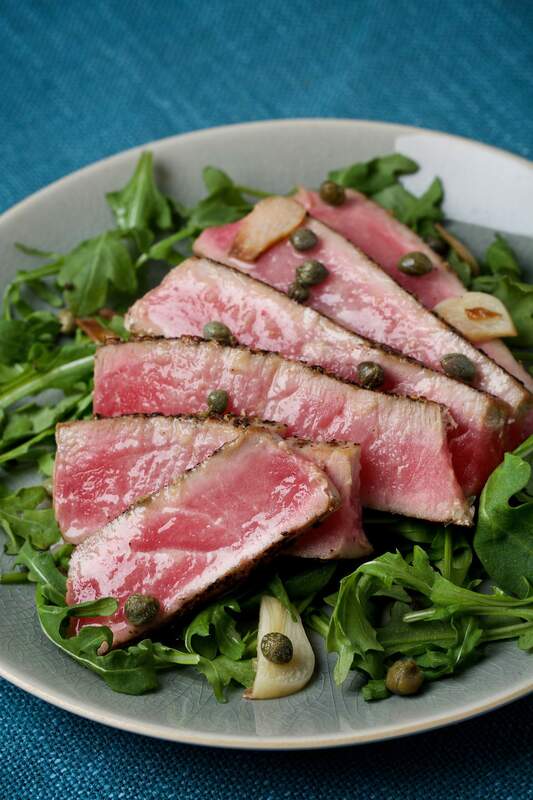 Tuna Steaks with Caper Sauce over Arugula. It would not be wrong to call this dish a salad; it does involve a pile of fresh greens, after all. But that descriptor doesn’t let on to how hearty, warm and satisfying a plate this is. The tuna itself, with its deep red color and meaty texture, gives the dish real substance. Sprinkling the fillets with a coating of cracked peppercorns and salt, just as you might a cut of beef, accentuates their steak-y appeal. Once the fish is seared (which takes mere minutes), the same skillet is used to simmer a lemon and white wine sauce that is enhanced with sauteed garlic, an umami-rich punch of anchovy paste and briny capers. A little butter melted in at the end goes a long way to enrich the sauce, giving it silky body and tempering the tang of the lemon without upsetting the dish’s healthful balance. INGREDIENTS:1½ teaspoons whole black peppercorns4 fresh tuna steaks/fillets (about 1 inch thick, 6 ounces each)¼ teaspoon salt2 tablespoons extra-virgin olive oil2 cloves garlic, thinly sliced1 cup dry white wine, such as pinot grigio2 to 3 tablespoons fresh lemon juice (from 1 lemon)1 teaspoon anchovy paste1 tablespoon capers, drained and rinsed2 tablespoons unsalted butter4 cups loosely packed baby arugula leavesMethod:Place the peppercorns in a plastic bag and crack them coarsely using a mallet or rolling pin, or use a spice mill to coarsely grind them. Sprinkle the tuna steaks on both sides with the pepper and salt, pressing the seasonings in a little so they adhere. Heat 1 tablespoon of the oil in a large heavy skillet over medium-high heat. Once the oil shimmers, add the tuna and cook for 1 minute per side (rare) or 2 to 3 minutes per side, if you like it done more. Transfer the fillets to a plate and cover loosely with aluminum foil. Reduce the heat to medium; add the remaining tablespoon of oil to the pan. Add the garlic and cook for 30 to 60 seconds, until it has softened a bit and become golden. Do not let it brown, or it will become bitter. Carefully add the wine (which will cause a lot of steam); increase the heat to high and cook for about 2 minutes, or until the wine has reduced by about half. Reduce the heat to medium; add the lemon juice (to taste) and anchovy paste, stirring to dissolve the paste. Once the mixture begins to bubble at the edges, add the capers and butter, stirring until the latter has melted. Remove from the heat. To serve, place a cup of the arugula on each plate. Slice the tuna, then fan the slices atop each plate and drizzle with the sauce.